Normally, when someone wants to paint their business or a room in their house, they go to a contractor, who in turns hires another subcontractor, and so on. But Harrison Edwards wanted to do things a little differently. Edwards, the founder of My Painter, LLC, says the Arlington-based startup is intent on being a one-stop shop for painting needs. Edwards said being an employee-based, rather than subcontractor based, painting company has allowed the company to form close relationships with its clients. Often for subcontractors, Edwards said clients have experienced problems trying to get ahold of which painters were working in which location. Edwards said he spends very little on marketing, preferring to work based on referrals. Edwards said the company works at about 30 t0 40 percent profits from their jobs. The company is small, with 13 employees currently, but is looking to expand with another seven employees in 2019. 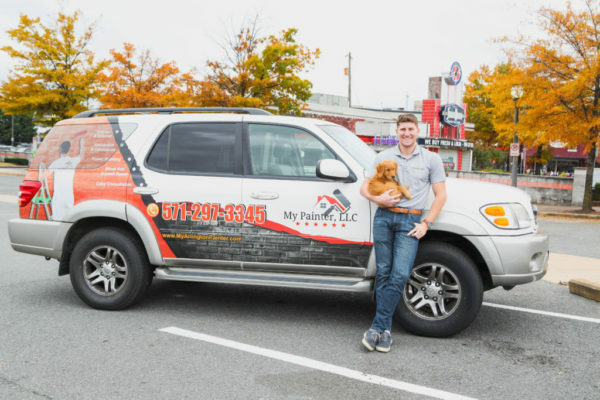 My Painter is based out of Clarendon and takes jobs throughout the Washington, D.C. region, but does 90 percent of its work around Arlington. Edwards founded the company in 2016 and said he was inspired by his father, who is a general contractor. Edwards wanted to work in specialized contracts, which meant learning a lot about painting and learning a lot about business. “There was a lot of trial and error at first,” said Edwards. Edwards said one of the lessons was that for painters, one of the most important parts of the job happens before the brush ever touches the wall. The preparation for a painting job is all about finding a way to respect and protect property as painting is going on around the space and making the painting work as unintrusive on the client’s home or office life as possible. Edwards said My Painter also sets itself apart by offering to bring on color consultants before the job starts to help the client identify what colors would work best for the space. In the aftermath of a job, Edwards says he helps clients coordinate with the painters on areas that may need work or touching up. “It’s all about taking the headache, heartache and hassle out of painting,” said Edwards.